Ever since I noticed the vast number of great blue herons flocking around this neighborhood, flying high overhead and not so high overhead with their vast wingspans and weird croaks and those long skinny legs trailing along behind alighting high up in the palm trees, standing there as if on top of the world, looking down on us all, what mere mortals you are!, so attached to the ground, the earth!, and standing tall atop the peak of a house and standing still—so still!—in the murky waters of the barranca and along the rocky shore of the marina, well, the fact of all these herons has taken me by surprise. Here in southern California these crazy majestic birds seem as common as seagulls, crows, and sunshine. 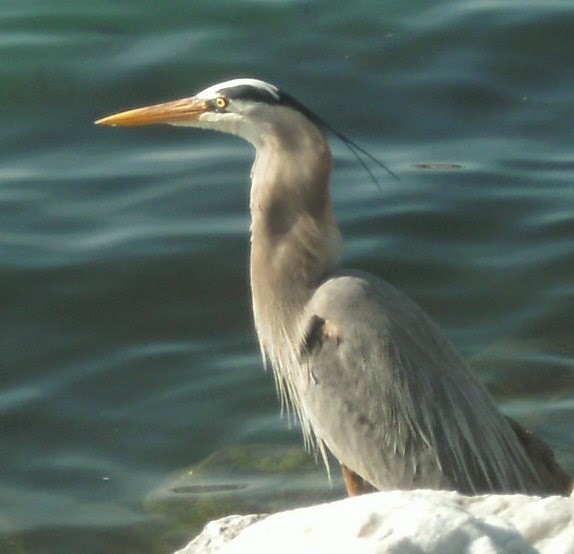 I used to watch a great blue heron who appeared each spring along the river I first lived on in the Upper Peninsula of Michigan, way up in the North Woods near the shore of Lake Superior. Suddenly one slushy mild day after a long winter I would see him (or her, but I will call him or her a him), gliding through the air upriver through the pine and cedar and birch. Then some lucky mornings or evenings I would see him standing stock still in the river just outside my house, where the river was a bit marshy, waiting for something to move in the shallows, and I loved watching, waiting for the quick movement that meant, usually, that the heron would eat. 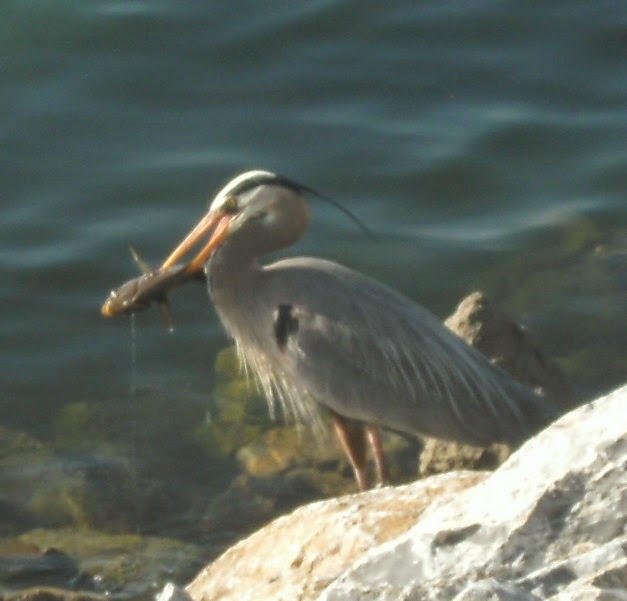 There were few fish in the river—it was mostly frogs, I think, that the heron went after. And I thought it a special, magical thing to be where I was along this river watching a great blue heron hunt for food. 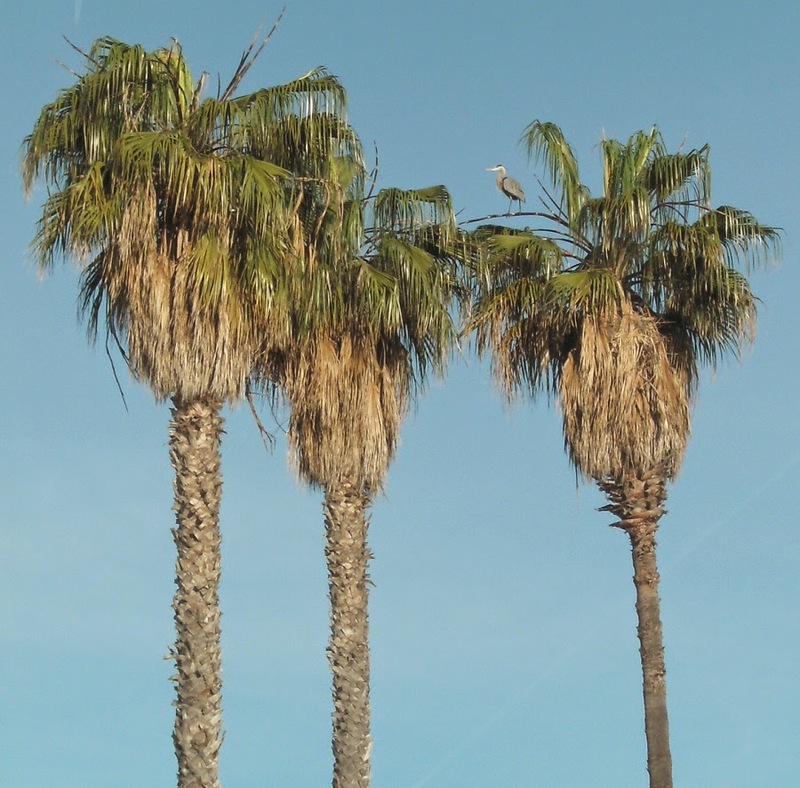 Now, I see herons all over, sitting way up in palm trees and in vacant lots, and one late afternoon one flew into the electrical wires that are strung above my yard. I heard a commotion, went out on the deck, saw a great blue heron lying in the garden, the border along the brick wall. He was laid out on his side next to a large clump of bird of paradise. He lifted his head, his long neck snaking and undulating a bit; I heard a weak crawk. The head returned to the grass and I think that is when the heron died. I walked across the yard to the bird. Over on the road, on the bridge that crosses the barranca, about 50 yards or so away, two people were talking loudly and pointing. They had seen the heron fly into the wires and fall. I looked up. The wires were swaying back and forth. The heron lay still. Soon it was dark. It was a Saturday. I had been sick with a debilitating flu for near two weeks. It was the four-month anniversary of my arrival in California. All this begged for significance. 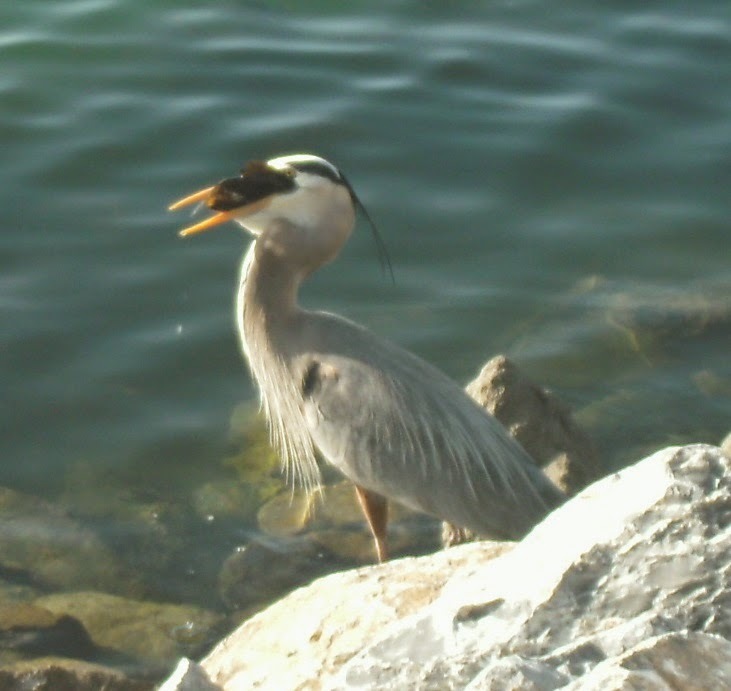 I went to my Animal Energies book to look up Great Blue Heron. No luck. So I went to the World Wide Web. 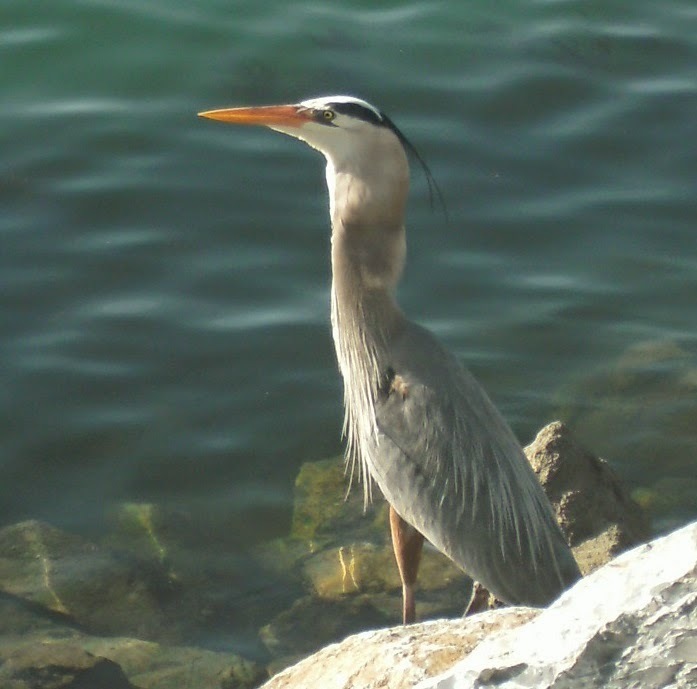 If Heron has come wading across your path; It is time to look deeper into aspects of your life that will bring out innate wisdom and show you how to become self-reliant. Are you grounding yourself regularly? 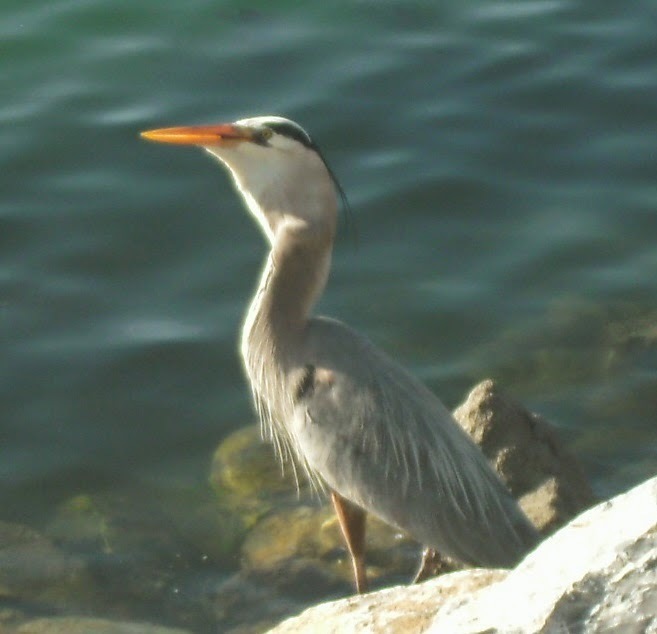 Heron teaches that grounding yourself in the earth and your spiritual beliefs will help you discover emotional insights more clearly and more quickly. Alternatively he could be teaching you how how to become comfortable in uncertain situations and to be watchful of opportunities to arise so that you can quickly grasp them and move on. 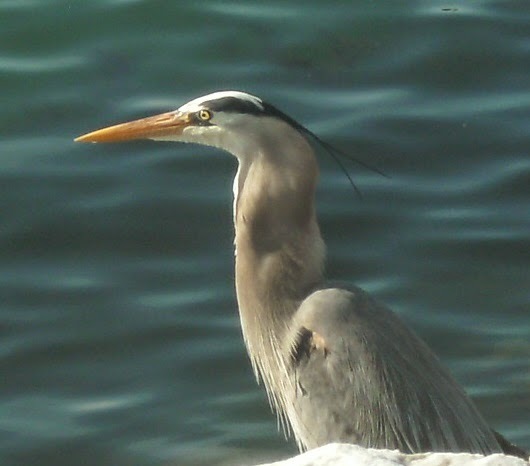 The appearance of GBH indicates that it is time to assert our own authority and to follow our own unique path in life. We need to listen to the inner calling of our hearts and not the ideas of others. There may also be a great opportunity coming our way and to grab it quickly when it comes. The GBH is also a symbol for a jack-of-all-trades. So I was going to write about this. I mean, how often does a great blue heron—so full of meaning!—fall out of the sky, into your yard, and die? But then the desire to attach meaning to and create a story out of every random event suddenly seemed in itself meaningless, reckless, perhaps even ridiculous. I mean, so what if a heron flew into some electrical wires and died? So be it. Beginning of story, end of story. Overnight, some critter got to the body. Then a guy from animal control came and took the body away. He picked the heron up by its big clawed feet and threw it in the back of his truck. 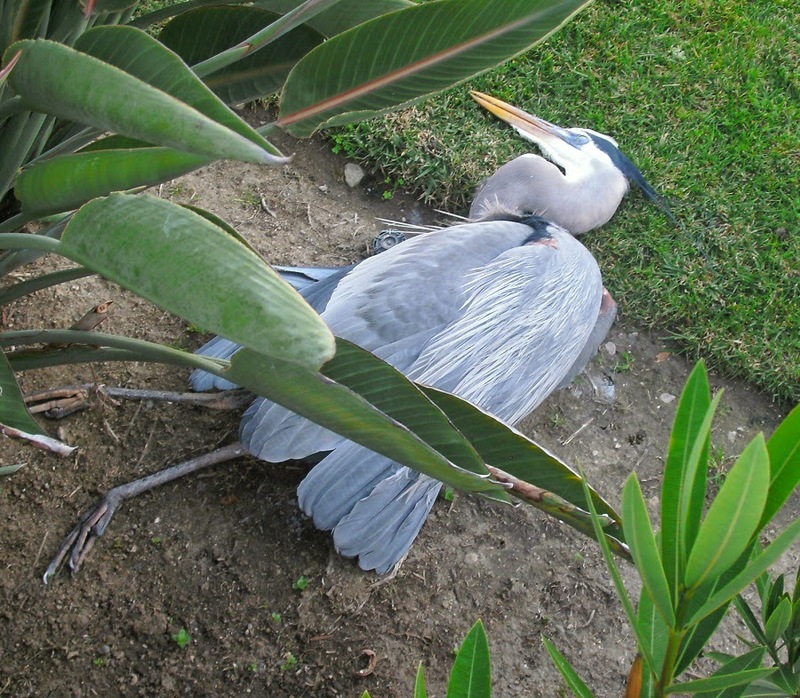 The day after, the taxidermist I had called about this perfect specimen of a heron lying in my yard returned my call. 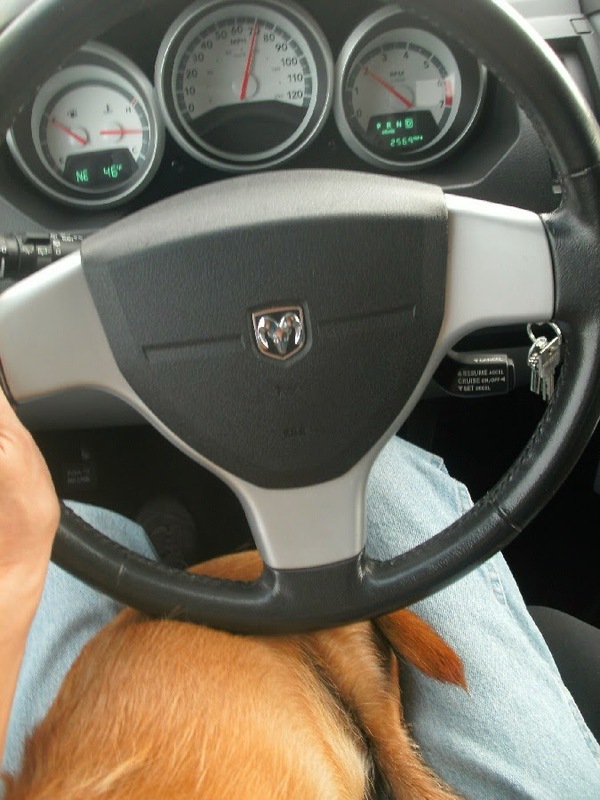 I was driving on the freeway. He told me that herons are protected and you can’t be stuffing them without a special permit, which he doesn’t have, and he told me he hadn’t been so sure that by returning my call he wasn’t dialing into some government entrapment scheme. 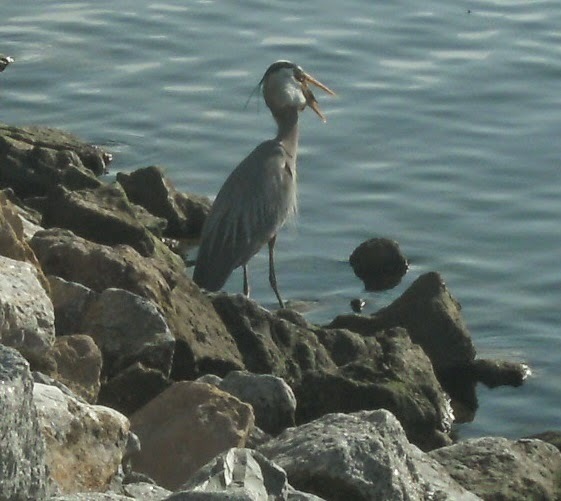 All in all, while in California, I have become less and less enamored with the great blue heron. Until today. This afternoon Josie and I were walking through the vacant lot, a walk we have come to love. It starts with Josie pulling me through the lanes of our neighborhood, panting and lunging at the end of his leash, so happy, so excited, and soon we’re crossing the street that puts us on the edge of the lot, a lush field now abloom with yellow, daisy-like flowers. I unsnap his leash. We are happy. We walk the dusty trails which are wide and unkempt and meandering and there is simply room to roam. I usually don’t take the camera but yesterday there was a great blue heron walking around the lot and Josie got to chase it, so today the camera was in my back pocket, just in case. 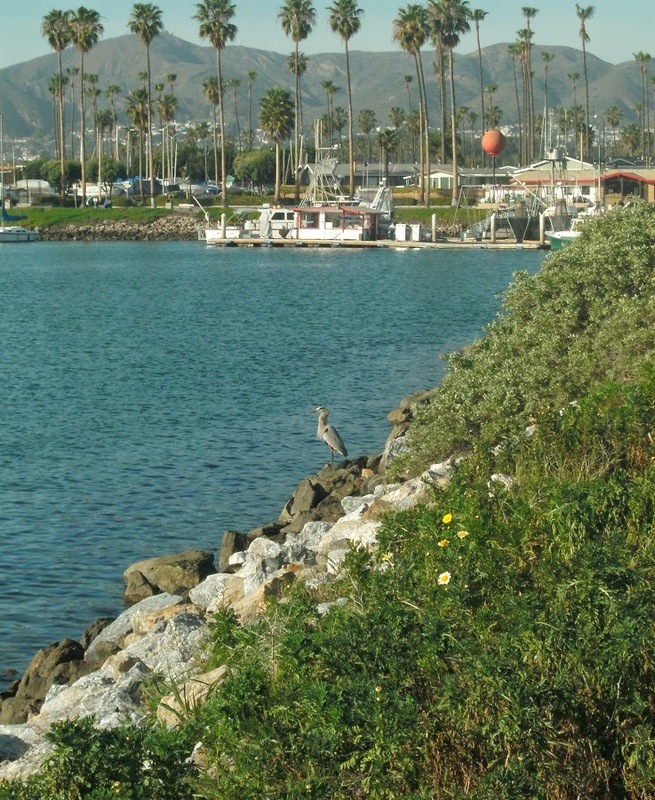 When I spotted a heron along the shore, I started taking pictures. 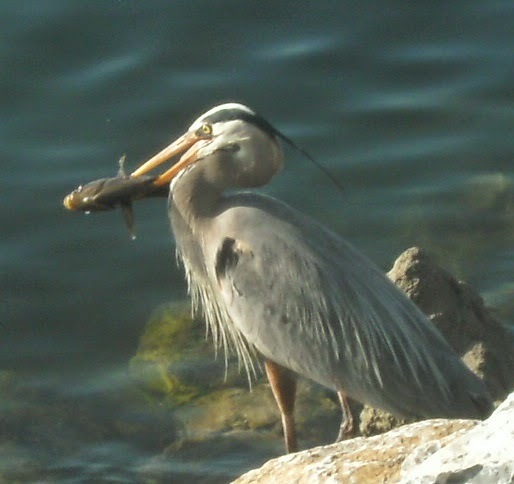 I realized the heron had a fish in his mouth. He picked the fish up. each day has its own little story, but, is it true? I visit my mom. We sit outside commenting on the beauty of the sky and the warmth of the sun while Josie works like a vacuum inhaling palm nuts off the ground. Later, I walk with my two sisters along the Pacific Ocean. Coming up in conversation, Byron Katie. Josie and I on our small sofa watching TV. From the kitchen arises such a clatter, then a puffed up Elliott flies by. He stops abruptly on the far side of the room. Josie struggles to get free from under the blanket, succeeds, takes a half second, bounds over to Elliott, sniffs, spins, tears through the room, the kitchen, straight outside, all business. I follow, just a tad less dramatically, stand on the deck. Josie is hopping around the darkening yard; it is evening. Stars appear. Through the dusk I see in the neighbor’s driveway a cat, Mr. Black and White. He stands still and alert, keened on Josie, who now sees him. 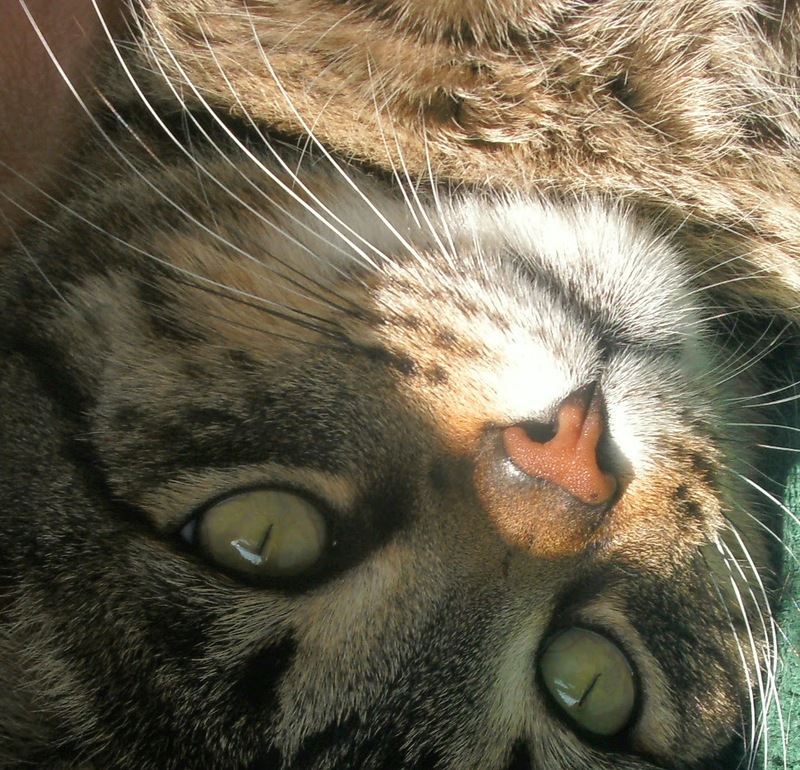 Josie tears, flat out, toward Mr. Black and White who bounds away, leaping atop the brick wall at the edge of the yard. He stands there in the gathering gloom looking down at Josie who is now investigating the ground below, back and forth, to and fro, snorting and grunting until he looks up, sees old Mr. B-and-W. He leaps and barks. 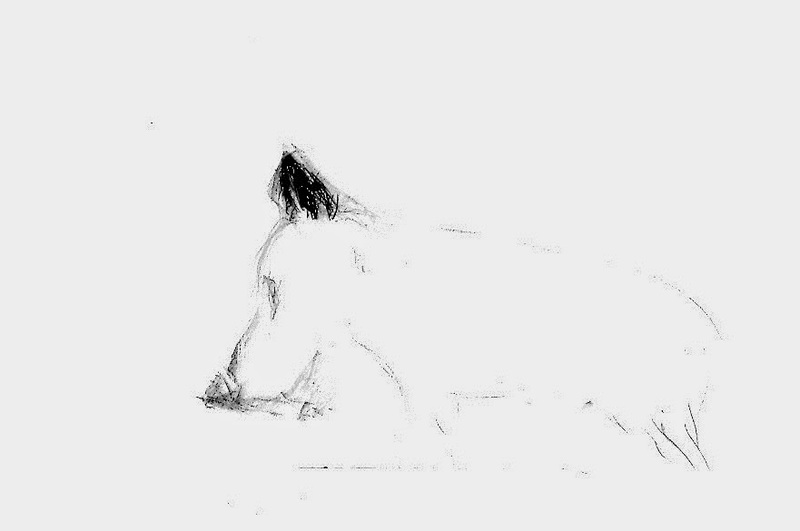 Mr. B-and-W walks along the top of the wall, not slowly, not quickly, just walking, out of sight. Josie runs and bounces around the yard, first nose to the ground then nose high in the air, barking and boofing. A few more turns and spins and he barrels inside, straight to Elliott, sniff, spin, barrel back out. Eventually, all is secure. I trust Josie. I give him a treat. He wags his tail. We settle back down, watch TV. I look up Byron Katie on the web. Ah, “The Work.” Those four questions designed to bust your self-defeating, negative thoughts, designed to let in peace and light, let in happiness. Ask: Is it true? Are you sure about that? Is it absolutely true? What if you turn it around? And around again? Around and around again and again inside and out like shaking out a freshly laundered shirt, snapping it free of creases before hanging it on the line to dry in the sun, to blow in the breeze. All you need to do “The Work” is right there on the web. And there is this: Beginning March 2015, Turnaround House, Ojai, California. Geez, Ojai’s just up the road. I was there once. Very picturesque, hotter and drier as it’s off the ocean, in the foothills, a little swanky as I recall. I click on “Turnaround House” just to see. A 28-day program to turn your life around. Yes, anyone can enter Turnaround House and do “The Work.” The accommodations look lovely. And the environment is free of all that stuff like tobacco and alcohol and drugs and … uh oh … caffeine. No tea? The meals are “healthy and sane.” I wonder about ice cream. Is ice cream sane? I see the fee: $20,000. Wow. Per day that comes to $714 and a little spare change. I try to imagine spending 28 days with a group of people who can afford to spend $20,000 on 28 days … Well, who am I to judge? If you can afford it and it works for you, why not? I try to imagine spending 28 days without tea or Josie or Elliott or the option of indulging in ice cream—TV?—opting instead for the company of wealthy women (why do I imagine they are all women?) who spend their time questioning themselves about what is and is not true. Turning things inside out. Finding peace. Finding happiness. Are there scholarships to Turnaround House? Do they do “The Hokey Pokey”? I fill out my profile on the website for my high school class which is holding a reunion in October. One of the questions is what have you done since graduation, which translates to: So, what have you been up to these past 40 years? I let that one go. For occupation I put down “independent business person.” There were something like 861 people in my high school class. I knew maybe 17 of them. On watch, taking life seriously. I find out that it is 77 degrees warmer right now right here where I am than back home where I am not. The country is in a deep freeze and we are not. Josie snoozes under the blanket. Back home we will need many more blankets. I am reminded of home by a blog post by this guy I’ve lately found interesting. He advocates for not following your passion but rather working hard at something, anything; it becomes your passion. He offers skills to help you get to work, get down to work at something, anything, and I’ve been most interested in his methods for organizing and planning one’s time. As an easily distracted independent business person, sometimes it is hard for me to get to and focus on those non-imperative-but-yet-important tasks and as well to go beyond what is necessary, get to some of those grander ideas, put in the time, the work, see what comes of it. His post today was kind of a conundrum, being about spaces, creative spaces some people have made in which to pursue their work, because it reminded me of that one split-second a few years ago which seemingly sealed my fate, caused me, ultimately, to buy and live in that crazy, bare-bones cabin nestled in the abandoned farm fields of Pelkie, Michigan, where right now it is 77 degrees colder than here and snow, well, snow deep enough so I may never get back home. But back then it was a mild August evening and while gazing from over by the river at this cabin I had not yet bought I had a vision: I saw myself in that cabin, and I was writing, and that was all I needed. I go back to Bryon Katie, find this article, an example of “The Work” with actress Jane Lynch. Boy, that’s confusing. Makes my head spin. So many questions asked but so many questions not asked. I email Turnaround House asking about scholarships and such, if there’s ever help with payment. I get a response: No. After all, all this stuff is free on the web—there are workbooks and apps and a hotline to call if you need help with your workbooks and apps. That’s a’plenty for those of us who can’t afford the luxury of a 28-day intensive self-inquiry in Ojai without caffeine or pets. I can’t help myself. What they do there in Ojai? Who are they? Not only those who attend but those who attend to those who attend. Who are they? Who are those guys? And how many are there? What are their stories? And what has brought them to squirrel themselves away for 28 days in March in Ojai to do “The Work” that might just help them change their thoughts, turn their lives inside out, upside down​? To do “The Work” that might just make them happy every day, every minute, for the rest of their lives? That might just help them see the negative as positive, the bad as good, the unacceptable as acceptable? What will these people do each day? Will each day be the same? The same four questions over and over? Will they ever get out? Go for coffee? Shop? Take a hike? Or must they stay at Turnaround House eating only sane food while spinning those same damn four questions? Will they study philosophy or religion? Will they be allowed to pray, speak to God, attend a religious service of their choice? Come up with their own questions? Will they attend a lecture on neurology? Explore the brain, how it works, how it doesn’t work? Are they allowed phone calls? Books? Email? The Internet? Can they surf the web? Have they left behind jobs? Families? Spouses? Partners? Pets? I want these stories, these answers, not testimonials. Oh my gosh. Turnaround House sounds like the perfect setting for a murder mystery. Has it been written yet? It is total immersion in self-inquiry. I am lucky. I cannot imagine wanting to leave my life for 28 days in order to delve into it via someone else’s structure, someone else’s methodology, someone else’s truth, at my expense. Yes, I am lucky. Of course I did leave my life going on six months now, but I dragged much of it with me and can eat ice cream whenever I want and ask not only four questions but four thousand if I so please. I think of the many ways I delve into my life—like right here, right now—and come out with mere kernels, a little something to chew on, to turn over, to turn inside out. Yes, I am lucky. Epiphanies and revelations come and go and vanish only to return, perhaps, at a later date, maybe dressed up, acting differently, but hinting at connections, revealing nuances. I did leave my life, didn’t I. Part of it, anyway. Searching for … happiness. Peace. Don’t mistake me for altruism. I walk with Josie through the vacant lot; the mind wanders. I work at something—anything—and the mind disappears. I talk to someone—anyone—and there is a different reality. I work on a jigsaw puzzle (of all things) and it is like meditation, like getting high: the mind floats, scans, wanders, focuses on tiny details. And I know what it is like to become obsessed with a negative, self-defeating thought. And I know what it is like to have it clench your heart, squeeze it like a snake. And I know how the thought sounds like a jackhammer hammering away at your brain and your sanity until you want to scream or just die. And I know how it crumples a soul. Sometimes I feel as if I have been cleaning out my parents’ house for 20-some years now. Of course, what is true is that it has only been off and on, now and then, for 20-some years now. Today I look through a box of stuff that came out of my sister’s shed just before Christmas and a top drawerful of stuff that was dumped in the drawer just before I hauled the chest out of the second-to-last place that my mother may ever live. I am taking the chest home to Michigan. The stuff in the top drawer … ? Prior to marrying my dad, my mom spent a couple of years in Chicago doing social work. She was a Case Aide in the Home Service department of some unknown agency. I have her performance reviews for 1945 and ’46 and they are excellent. Each year she earned a $10-a-month raise. In 1945, that boosted her monthly salary from $145 to $155. At the time she lived with a group of women at 7343 S. Ridgeland. I’ve got some pictures. For the 1941-42 school year my mom was hired as a Teacher of Mathematics and Library Supervision in her hometown of Aledo, Illinois for a 9-month salary of $960. I have the tattered blue slip of paper titled Teacher’s Notice and Contract. This came on the heels of her graduation from the University of Illinois with a Bachelor of Science in Education. I have the diploma. I also have her sketchbook from a couple of years back, two or three very old, small, tattered Bibles, a plastic Santa Claus, some nail files, her and my dad’s high school yearbooks, their marriage certificate, some stray cough drops, notebooks of notes and quotes and information, old letters, this and that, photographs. 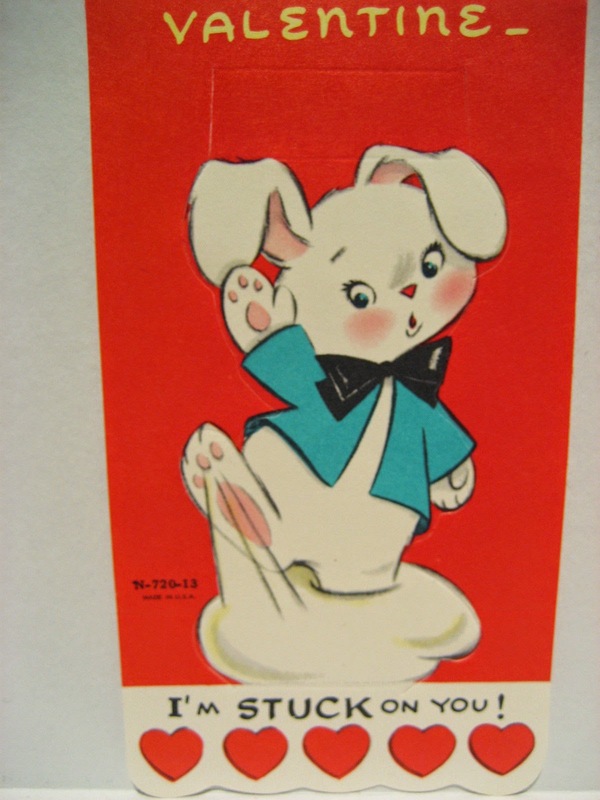 Some of this for years my mom kept in a desk drawer or somewhere stored away. This is the stuff that survived every move, no matter where to or by whom. This is the stuff that could not be thrown away. 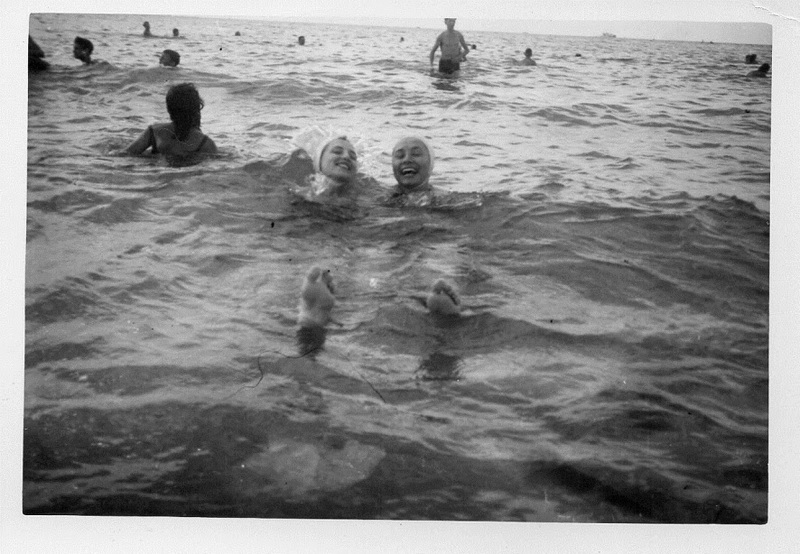 So now I will keep this picture of my mom swimming in Lake Michigan in the mid-1940s, perhaps at some South Side beach. But I will not keep the cough drops. My mom on the right. This evening a beautiful crescent moon with Venus nudging gently nearby. to a friend or two, and I’ve started a project of every day clipping my horoscope from the L.A. Times, a subscription to which I started at the beginning of the year and I must admit that except for clipping the horoscope and the crossword puzzle (to wrangle with another day) I’m not paying much attention to the Times, having turned my attention instead to Gwen Ifill and Judy Woodruff on PBS NewsHour which I watch first thing every morning, getting last night’s news today. After I clip the horoscope I swab its backside with rubber cement and paste it in a datebook, thereby building a collection of daily horoscopes which may amuse me one day. This is why I was so happy to buy rubber cement a week or so ago. It is the perfect—the only—adhesive for this project. You see, my father used to clip box scores from the Chicago Tribune and paste them on the green-tinted pages of a steno book. Rubber cement was his chosen adhesive, so must it be mine. Back then rubber cement came in a small, brown glass jar with a screw-on lid made of metal with a brush attached to its underside so that the brush came out of the jar laden with rubber cement and that distinct rubber cement smell. After clipping the box scores (or whatever they are called in hockey), my dad placed them face down on another sheet of paper and liberally brushed their backs with the gooey cement, going well beyond the edge of each clipping. The residual cement could then be rubbed off the paper and rolled into balls. That was the fun of it. Not watching Dad pasting box scores in a steno pad, but making those little rubber cement booger balls. These days rubber cement comes in a plastic jar, not glass, but otherwise it seems much the same. Except I’ve not once been tempted to roll it into a booger. Have I lost my joy? 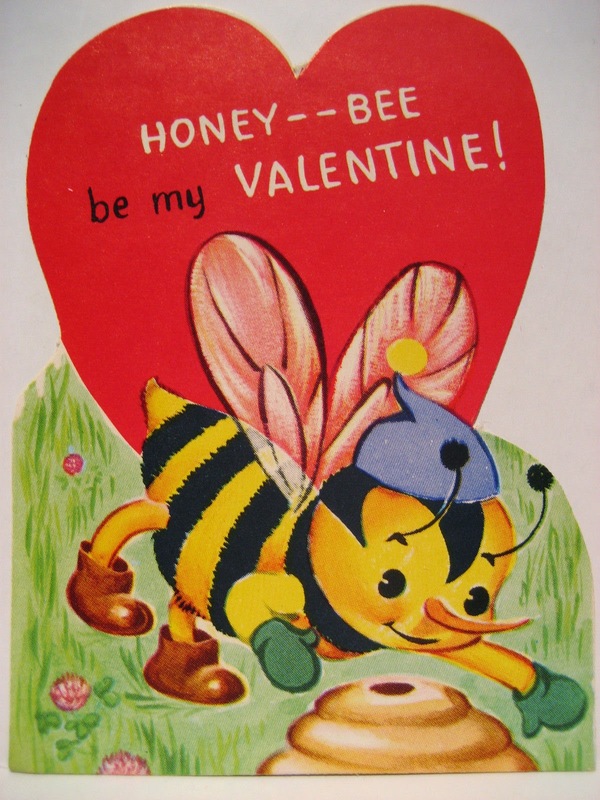 It came after I had sent off some friendly valentines. 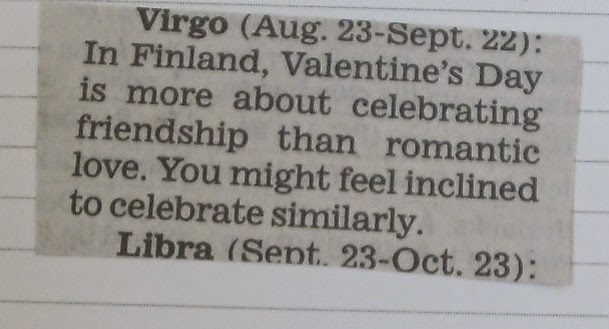 It seems today my horoscope and I are on the same page. Even though I am not Finnish. 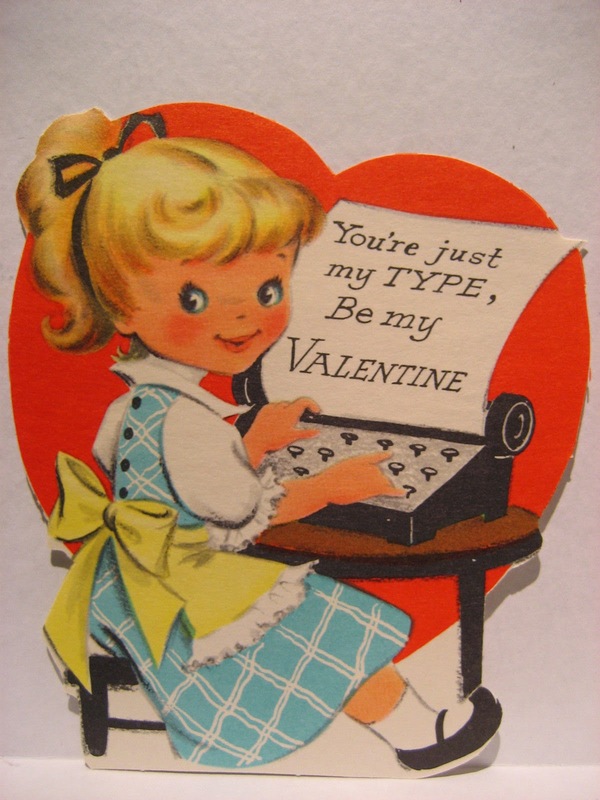 Sitting earlier this morning with Josie curled at my side watching the news I thought what a wonderful little valentine he is, and then I saw that his curled body made the shape of a perfect little half heart. Later, as we walked, as we do every morning, it was warm with a low, bright sun, and I was very aware of how when we return home to the U.P. I will miss the ease of these walks. One big difference between living where the weather is reliably warm and sunny as opposed to living where the weather can easily be six feet of snow and another blizzard is the ease of things like daily walks. If today I were home in the U.P., a morning walk with Josie would have been something entailing a lot more time, a lot more effort, and maybe we would not have been able to do it at all. 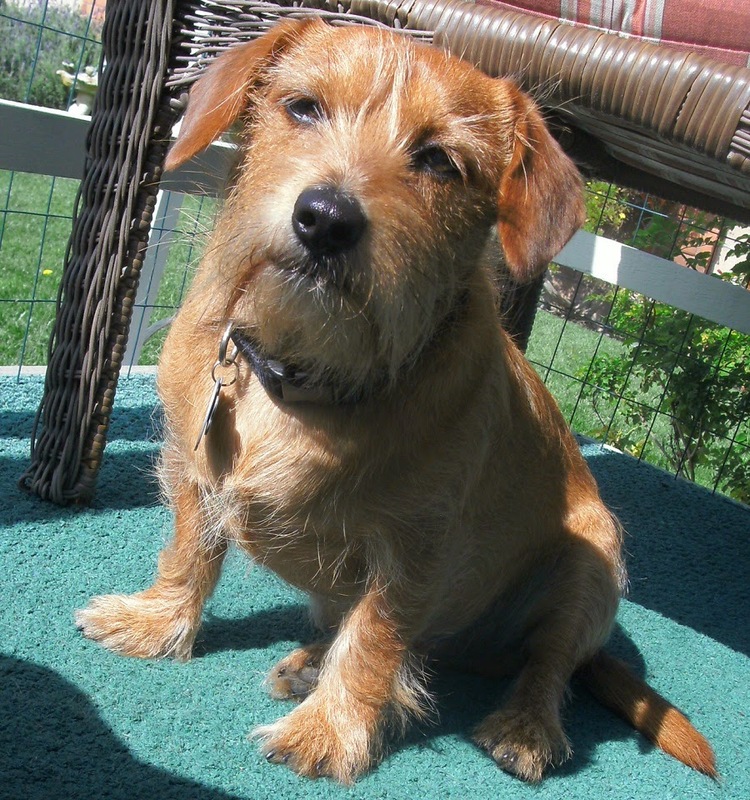 There is, after all, or so I hear, a blizzard out that-a-way, and Josie is, after all, short-legged. So maybe we would not have walked this morning. Or this afternoon. Would I have missed it? I have always loved a blizzard—its force, its dominance, its wildness, its beauty, the incredible stillness it leaves behind—so maybe we would not have missed walking. Maybe we would have had a barrel of fun trying to walk. Maybe Josie would have made me laugh bounding through drifts of snow as Buster used to do. Maybe a fire in the woodstove and the wind whipping around the cabin would have made us feel all snug and cozy and so very lucky to be warm and dry. 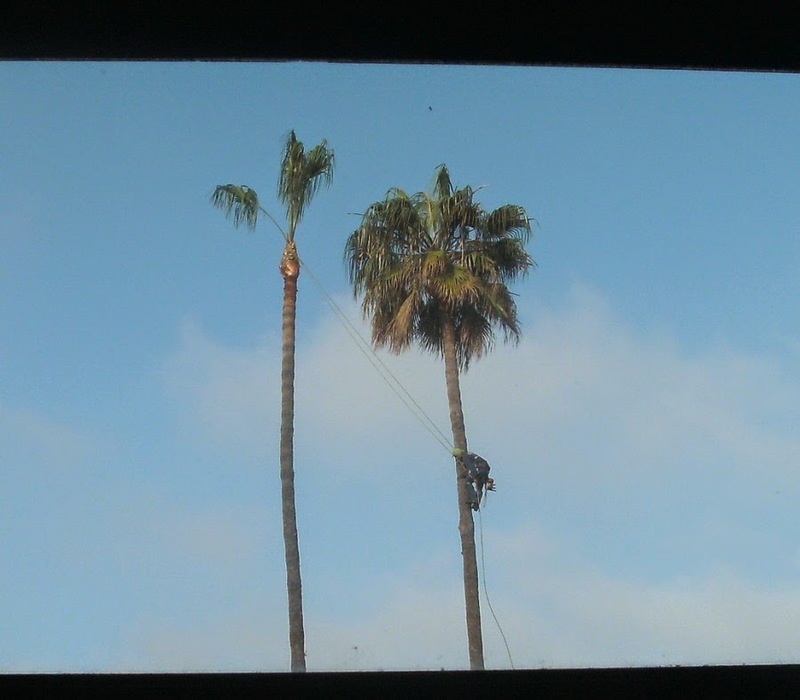 This week in my neighborhood they trimmed the palm trees. By the third day, they were on my street. 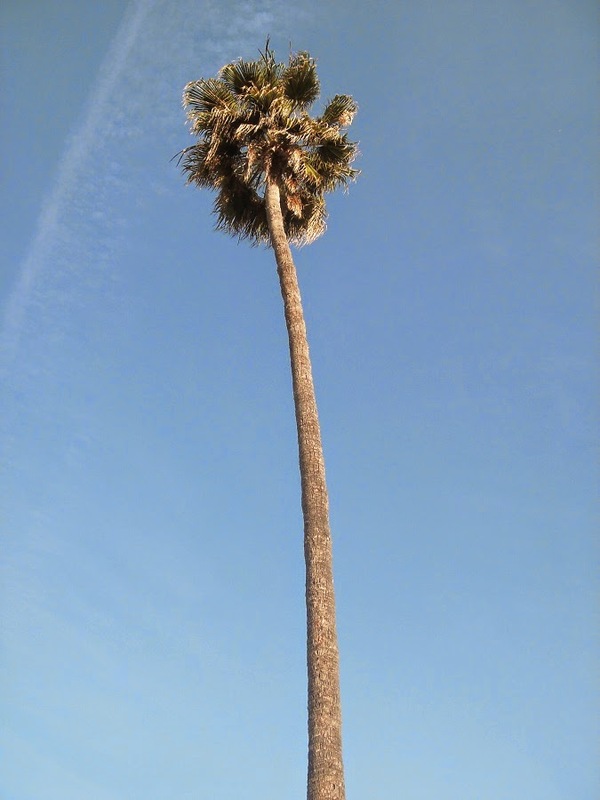 There are hundreds of palms in this little pocket of town, and the more I look at them, well, perhaps it is the Midwesterner in me that finds it hard to think of them as trees, real trees, like the oak, the maple, the birch. They seem more like something out of Dr. Seuss. Anyway, one day the guy who seemed to be in charge of the trimming operation was right in front of my house so I went out to talk to him. 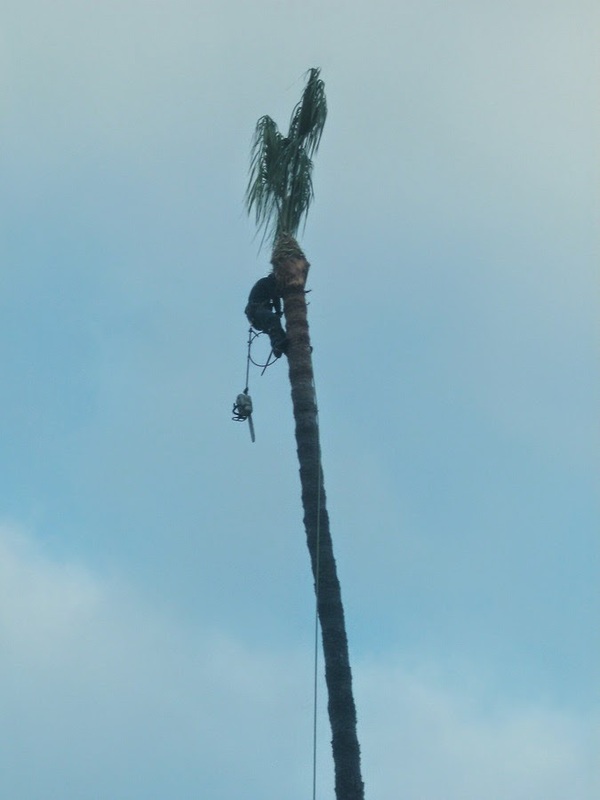 I figured he was in charge because he was not climbing a tree, not wearing a hardhat, not wielding a chain saw, not piling up felled fronds and debris, not swinging a leaf blower, not feeding fronds and stalks and such into a wood chipper. Neither was he in a cherry picker. Rather, he was driving around in a truck with a yellow light on top, and he just happened to stop and get out of his truck. He was kind enough to answer some questions, and we shouted at each other above the noise of the chain saws and the wood chipper. He said the trees were about 40 to 50 years old. Yes, that’s a chain saw swinging from his belt. 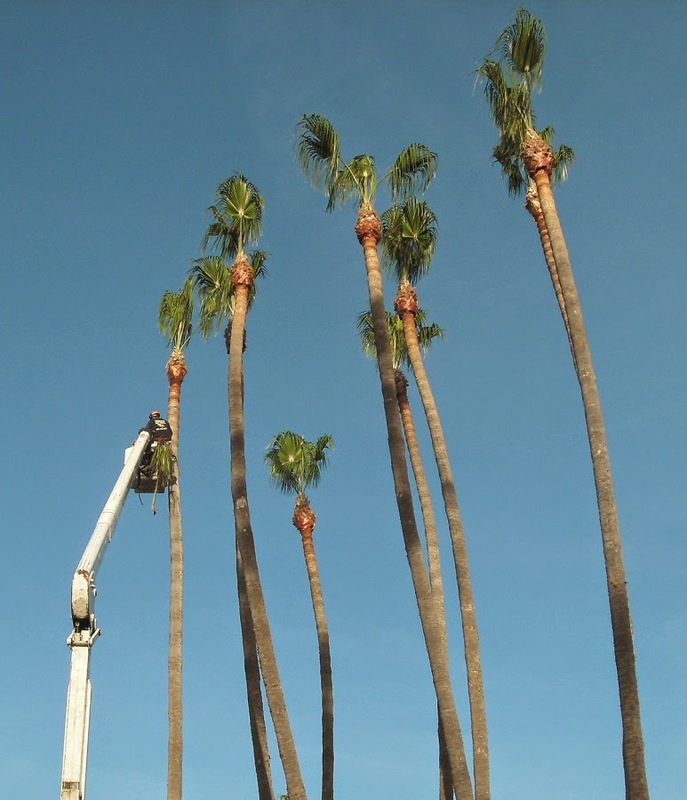 And 70 to 80 feet tall. Then I asked the most pressing question: Is it true that rats nest in the old, dry fronds that hang like big beards on untrimmed trees? 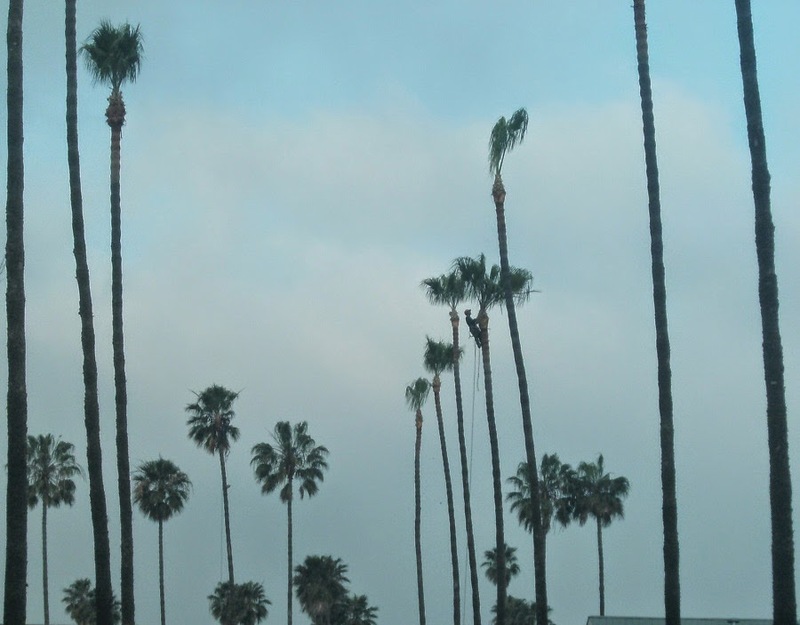 Yes, he said, and pointed to some palms across the way, in the next neighborhood. You’ll find colonies of rats in there, he said. oddities (if you ask me), right there. The palm and the heron. Because I see so many herons in the trees, I asked if they nest there. He said no. look like leather shoulder pads. No rats or nests or anything. 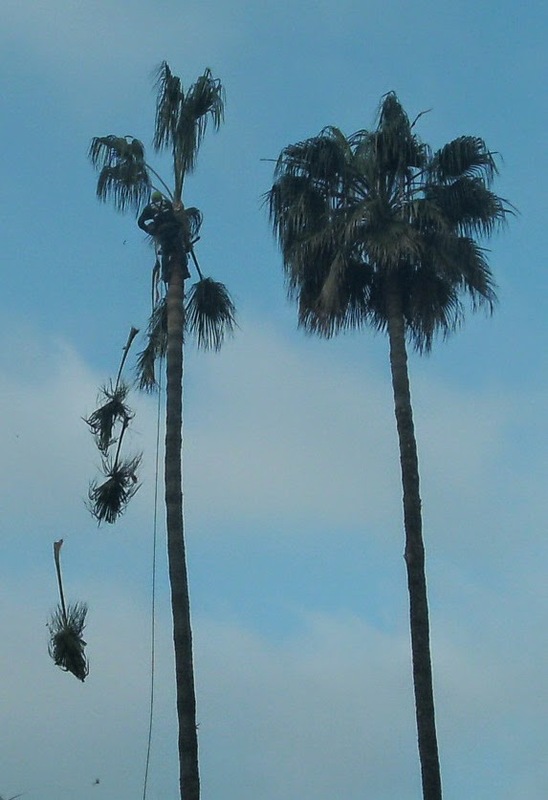 He said in this neighborhood they trim the palms at least once a year. 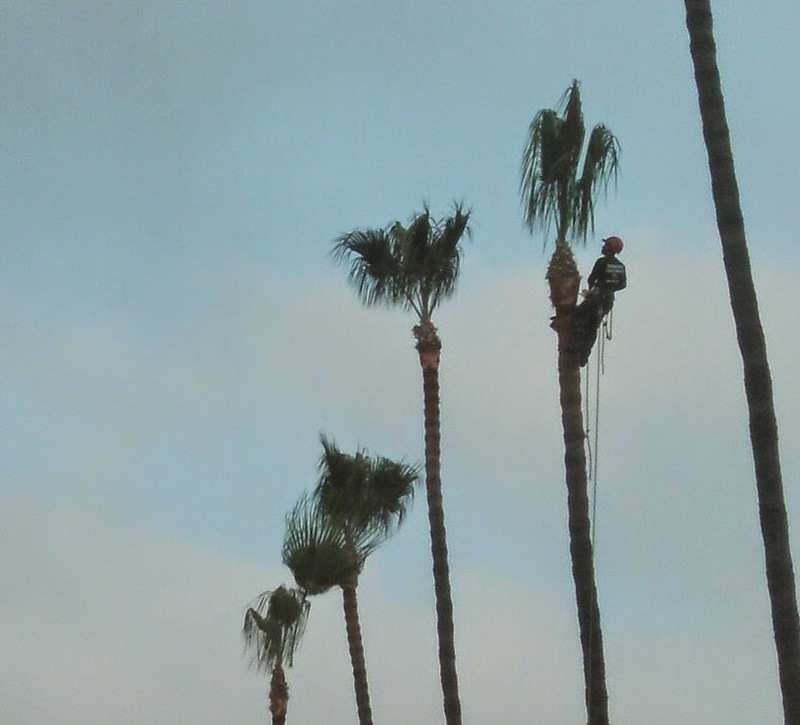 In other neighborhoods, palms never get trimmed. Yes, I smell a rat. Maybe two. Which reminds me of a poem. With thanks and apologies to Edward Lear. Ah, the mysteries of life. How did this happen? The sudden end of this journal. Or, maybe ... is it just a short break? An extended vacation? What? What is it? Well, whatever it is, it is fine. It feels good. 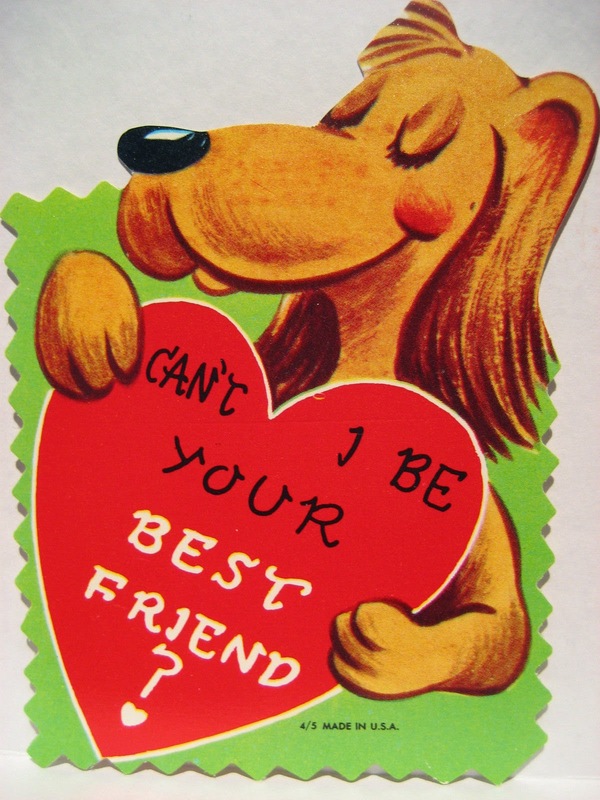 Just thought I would let you know. Surely, this can’t be safe.